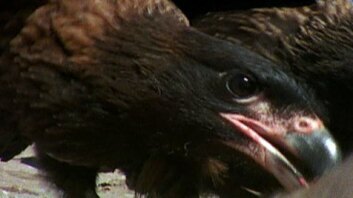 Johnny Rooks usually prefer vulnerable chicks as a meal, but one ambitious group targets prey much larger than themselves. Their quest? Satisfying their hunger by any and all means available…which means terrorizing their neighbors. But just who is this masked bandit? He’s none other than the striated caracara, also known as Johnny Rook. Despite their sometimes unsavory reputation, Johnny Rook is among the most intelligent of the bird species—they’re fearless, daring, and famously curious. They’re also one of the rarest—they exist only on the Falkland Islands and a few other small islands off the coast of South America. The population is thought to be less than 2500. Johnny Rooks will eat just about anything but chicks are a favorite. They share these islands with the world’s largest breeding population of endangered black-browed albatross…and this season’s brood has arrived. This little guy doesn’t stand a chance. 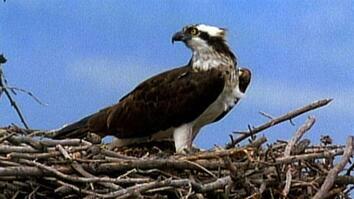 Young gangs of Johnny Rooks are even bolder…going after prey much larger than themselves. 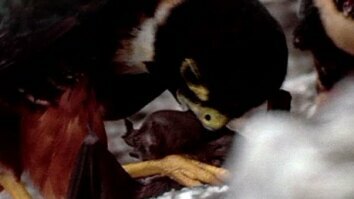 This Johnny Rook is resolute, using his long talons to dig into the fur seal pup’s back. He will not give up. The whole gang appears…wanting a piece of the action. But the pup’s cries don’t go unheeded, and mother comes to the rescue. Their plot foiled, the birds take to the wing again and wait for the next opportunity.